This title is directed primarily towards health care professionals outside of the United States. 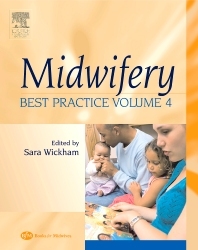 It is Volume 4 in the Midwifery: best practice series. Each of the volumes in this Series is built around the familiar core of four main topic areas relevant to midwifery (pregnancy, labour/birth, postnatal and stories/reflection) but also includes a number of "focus on..." sections. These are different in each volume and reflect a wide range of key and topical issues within midwifery. Each volume builds upon the others to provide a comprehensive library of articles that shows the development of thought in key midwifery areas. Volume 4 offers a range of wholly new topic areas within the "focus on..." sections, including "communities of women", "birth centres" and "exploring diversity". 2.2 What's it like to work in Siberia? 2.3 What's it like to work in Ontario? 3.1 Risk and risk assessment in pregnancy - do we scare because we care? 5.7 Don't take it lying down! 6.3 A compromise for change? 7.1 Postnatal Care: is it an afterthought?